You may have seen this coming when the new ASP.NET forums were introduced a few months ago, but now the word is official. Microsoft's official ASP.NET community website is getting a face lift and a live preview is now online. 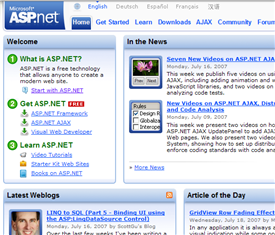 The new ASP.NET site format closely matches the style that was introduced in the forums, adopting the busier portal style website over the more design oriented approach. The new homepage has more of an MSDN feel to it, featuring recent blog posts from prominent Microsoft bloggers and latest news front and center. For better or worse, the new format definitely packs more information into less space. So what do you think? Is the redesign a step in the right direction for the official ASP.NET community website? The design looks a little dated to me, but that's definitely just one opinion. Check it out and let the ASP.NET web team know what you think. I am not a big fan of the web-part look. A lot of "heavy" boxes and the lack of finesse - the load time is not impressing either. But all this aside, I like the content of the site and it is still the most important to me.